Format: Students progress through the course in four levels: freshman, sophomore, junior and senior. To progress from one level to the next, students must complete the required hours, required operations, written evaluations and practical evaluations for each level. 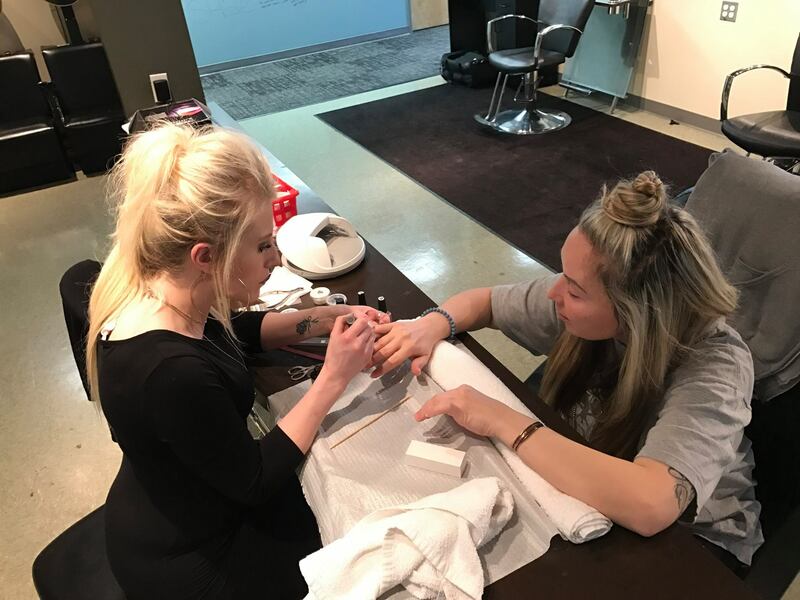 Freshman level is three weeks and is spent in a classroom setting where students learn the basics in manicuring, nail extensions, and practice on each other and models. Students are given written and practical evaluations at the end of each week. After successful completion of the 3 weeks of freshman classes, students are assigned to the clinic floor to start getting practical experience and to learn good customer service. Once assigned to the clinic, students attend other classes each week. Throughout the instruction, we teach a wide variety of classes on artificial nails including fiberglass, acrylic, gel, and many others. In addition to the above mentioned classes, students also attend half- and full-day classes at the sophomore, junior, and senior levels to increase their skills in business and in preparation for written exams and for the state licensing exam. To qualify to take the Oregon State Board of Barber and Hairdressers National written exam, that covers the subjects of nail technology, pedicuring, manicuring, and artificial nails. To identify nail diseases and disorders. To perform tasks of Nail Technology in a proficient manner that will support the graduate in employment. To have an awareness of personal self worth, pride and professionalism. By submitting this form, I agree to being contacted by phone or email.